Grand Central Station is a downloadable Landmark Building for SimCity 4 Rush Hour/Deluxe, released as the Plugin Pack 010 free Downloadable Content. It is a recreation of Grand Central Terminal in New York City, New York, United States of America built in 1903 and roughly represented as it appeared before the Park Avenue Viaduct began construction in 1918. 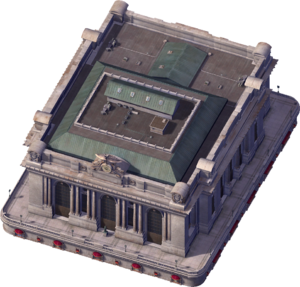 Grand Central Station is probably the most unusual of the game's landmarks based on a real place with Maxis depicting the building in close to a state it had not been in for nearly 90 years by the time the game was published.